The right cushion covers can turn an ordinary sofa or bed into a fashionable work of art. All of our silk cushion covers are sold in matching pairs and made from real Chinese taffeta silk embroidered with a stunning range of beautiful designs and colors. These majestic silk covers are all hand-stitched in Thailand, where the artisans who create them take great pride in their work. Our silk cushion covers make a fantastic gift as well. 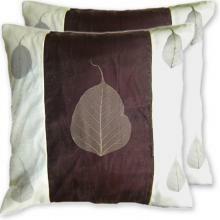 Crafted out of Chinese taffeta silk and dry leaves, this contemporary looking cushion cover set fits well with any white, beige or light colored sofa, bed or chair.